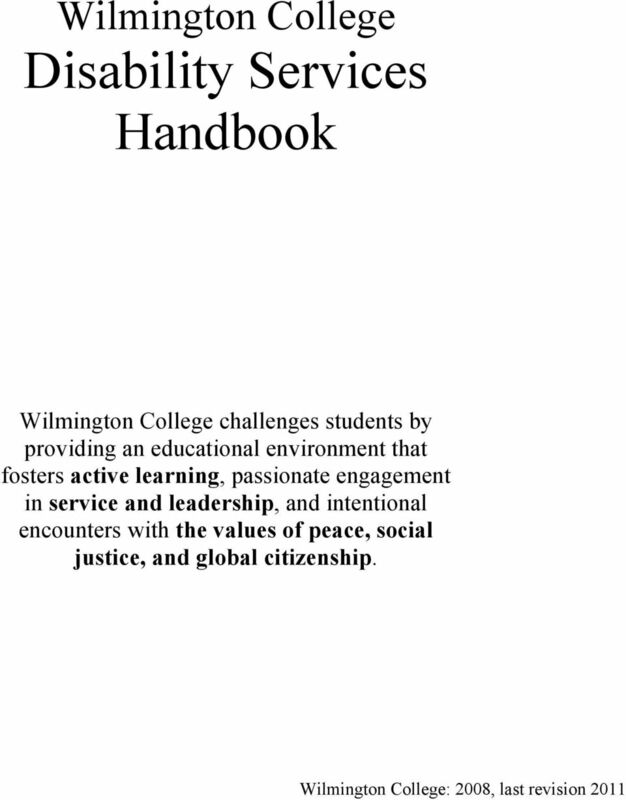 Download "Wilmington College Disability Services Handbook"
1 Wilmington College Disability Services Handbook Wilmington College challenges students by providing an educational environment that fosters active learning, passionate engagement in service and leadership, and intentional encounters with the values of peace, social justice, and global citizenship. 5 are more effective when coupled with authentic dialogue about strengths, needs, and effective teaching and learning strategies. Possible academic adjustments include but are not limited to: Early registration Early syllabus Room changes/classroom accessibility Testing accommodations (e.g. extended time for test taking, testing in a quiet location, reader/scribe) Electronic text Note takers Tutoring Note: Disability Services does not provide services of a personal nature such as attendant care, homework assistance, and typing services. Student Evaluation Wilmington College complies with Section 504 of the Rehabilitation Act of 1973 in its course examinations and other procedures for evaluating student academic achievement in its programs: [A] College shall provide such methods of evaluating the achievement of students who have a [disability] that will best ensure that the results of the evaluation represent the student s achievement in the course, rather than reflecting the student s impaired sensory, manual or speaking skills (except where such skills are the factors that the test purports to measure). A student who does not do acceptable work is not given credit. If a faculty member becomes aware that a student with a disability is having difficulty, a referral to the Early Alert Retention Committee and to the Academic Services Director will be made. Confidentiality All inquiries about Disability Services are handled in a confidential manner. Students who wish to use academic adjustments decide whom to inform about their condition through the process of self-identification. 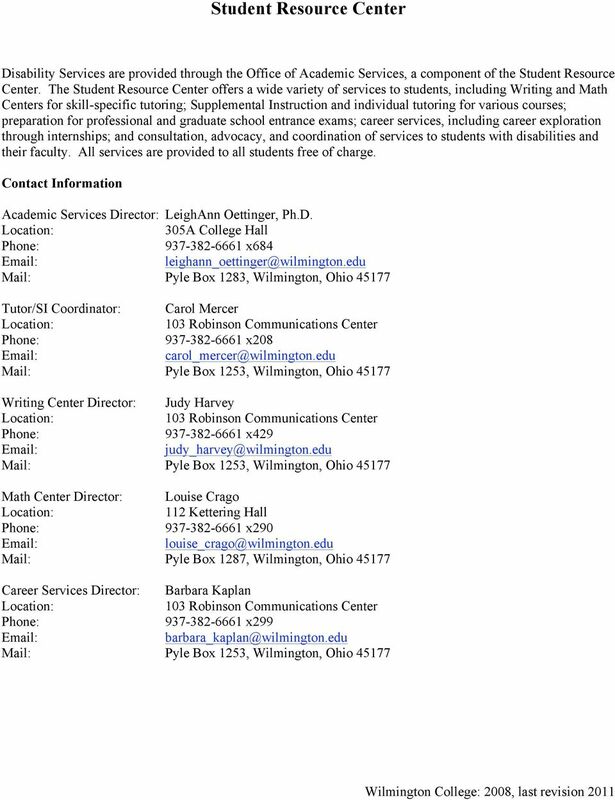 With the consent of the student, information from Disability Services about an individual s disability is provided in limited circumstances on an as-needed basis. 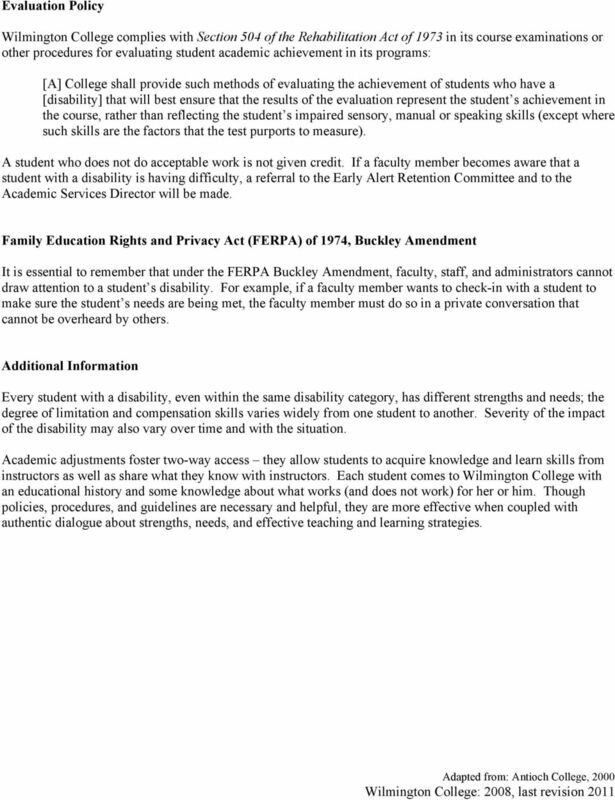 It is essential to remember that under the FERPA Buckley Amendment, faculty, staff, and administrators cannot draw the attention of others to a student s disability. 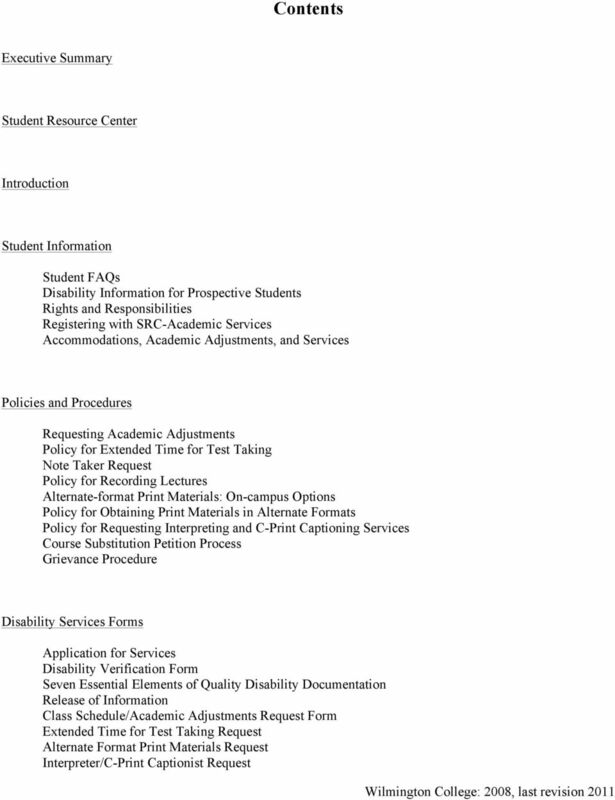 Grievance Procedure A student has the right to appeal concerns about the process of obtaining accommodations, the accommodations plan, the manner in which accommodations are provided by the faculty, issues of confidentiality, and any other concerns related to Disability Services. 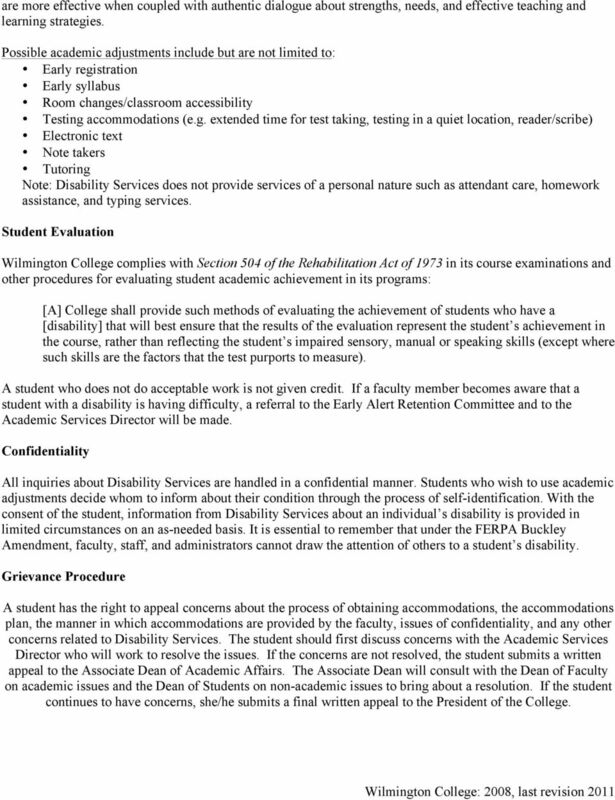 The student should first discuss concerns with the Academic Services Director who will work to resolve the issues. If the concerns are not resolved, the student submits a written appeal to the Associate Dean of Academic Affairs. The Associate Dean will consult with the Dean of Faculty on academic issues and the Dean of Students on non-academic issues to bring about a resolution. If the student continues to have concerns, she/he submits a final written appeal to the President of the College. 7 Introduction We know that equality of individual ability has never existed and never will, but we do insist that equality of opportunity still must be taught. Franklin Delano Roosevelt Wilmington College is rooted in historic Quaker values that include integrity, service, simplicity, equality, peace, social justice, and respect for all persons. The College seeks to educate the whole person intellectual, emotional, physical, and spiritual in ways that foster critical thinking, reflection, the free exchange of ideas, open inquiry, tolerance, and a desire for lifelong learning. Students with disabilities have graduated from Wilmington College with degrees from every academic area, and these students have demonstrated the value of persons with disabilities to our community and paved the way for others to follow. Disability Services works with students and faculty to ensure that a disability will not be a barrier to equal opportunity and access to educational programs and services; however, the student s own engagement in the accommodation process is a key factor to her or his success. 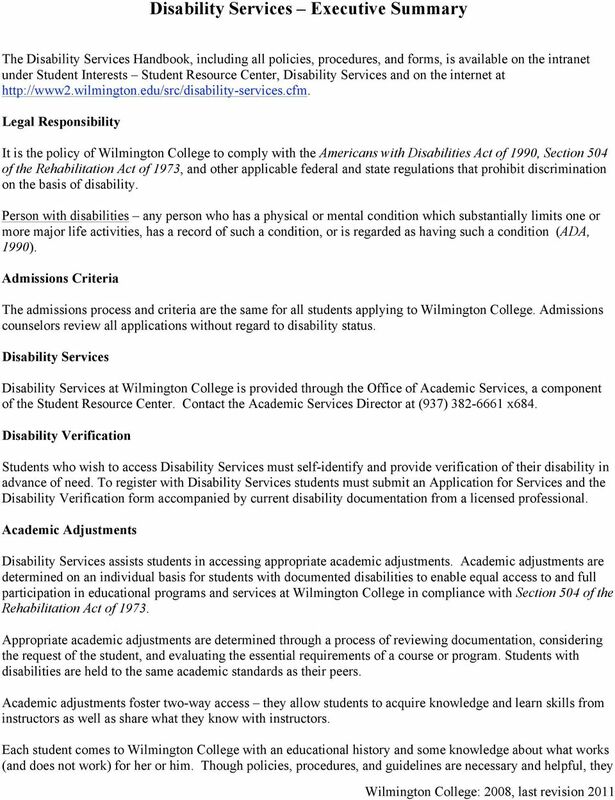 This handbook provides information about policies, procedures, and resources available at Wilmington College for students with disabilities. Definition (Americans with Disabilities Act, 2000) Person with disabilities any person who has a physical or mental condition which substantially limits one or more major life activities, has a record of such a condition, or is regarded as having such a condition. Major life activities include caring for oneself, performing manual tasks, walking, seeing, hearing, speaking, breathing, learning, and working. Basically, any function that is performed routinely by individuals is considered a major life activity. 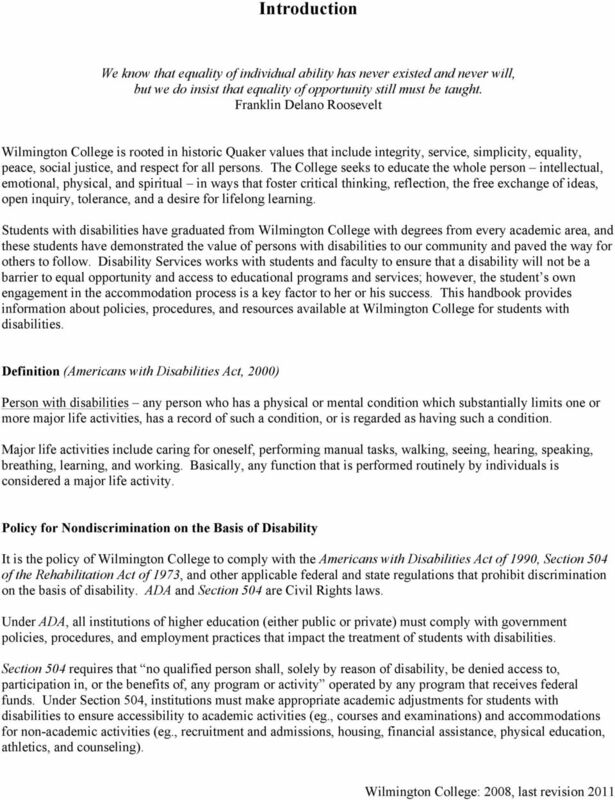 Policy for Nondiscrimination on the Basis of Disability It is the policy of Wilmington College to comply with the Americans with Disabilities Act of 1990, Section 504 of the Rehabilitation Act of 1973, and other applicable federal and state regulations that prohibit discrimination on the basis of disability. ADA and Section 504 are Civil Rights laws. Under ADA, all institutions of higher education (either public or private) must comply with government policies, procedures, and employment practices that impact the treatment of students with disabilities. Section 504 requires that no qualified person shall, solely by reason of disability, be denied access to, participation in, or the benefits of, any program or activity operated by any program that receives federal funds. 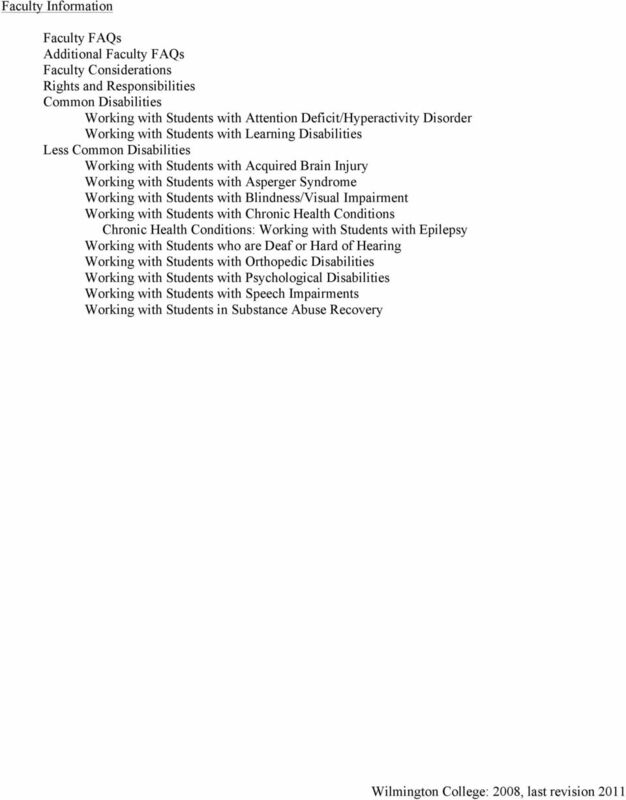 Under Section 504, institutions must make appropriate academic adjustments for students with disabilities to ensure accessibility to academic activities (eg., courses and examinations) and accommodations for non-academic activities (eg., recruitment and admissions, housing, financial assistance, physical education, athletics, and counseling). FREQUENTLY ASKED QUESTIONS (FAQs) GED Test Accommodations Questions about the process of requesting accommodations on the GED test What types of conditions or impairments might need to be accommodated? IDEA, IEP'S, and Section 504 Plans: Differences between K12 and College Many students and families find it difficult to understand how different disability laws affect the provision of services at college. 1. Recipients meet their obligation not to discriminate on the basis of disability. Gordon Conwell Theological Seminary Charlotte Masters of Arts in Christian Counseling Program CO 867 Practicum Fall 2015.
disabilities may be eligible for certain services, and access to these resources can enhance their academic and co-curricular experience. SECTION 504: EDUCATION S NEGLECTED RED-HEADED STEPCHILD. Section 504. holds the key to school success for many children & young adults! Special Education Advocacy for Children in Oregon. Brian V. Baker, Juvenile Rights Project, Inc. & Joel Greenberg, Oregon Advocacy Center, Inc.